Halfway through our trip I began to wonder if I wasn’t on a geology trip rather than a birding trip. Four days into our trip all I’d managed to see was a couple of California Gulls, and even then only at a distance. 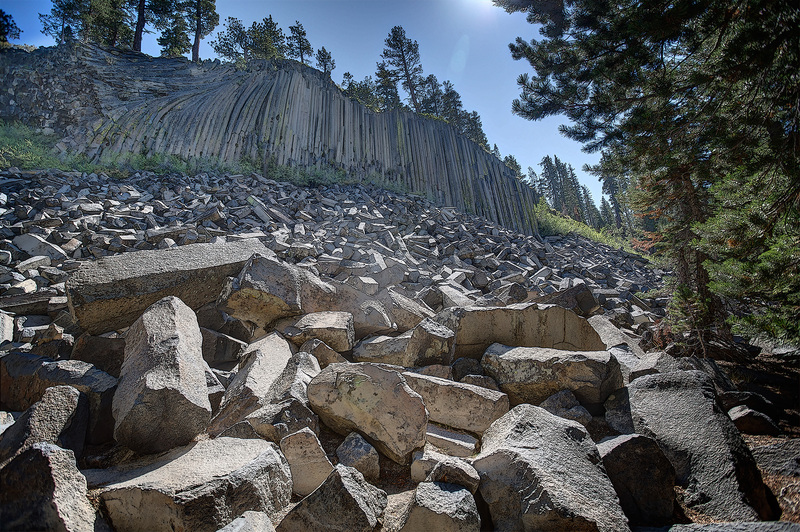 And here we were on a morning trip to see The Devil’s Postpile National Monument, which required dropping down thousand of feet on a single lane road very close to a cliff, too close for Leslie. I would have loved to get some shots of the surrounding mountains, but I wasn’t going to stop and meet another car coming up the hill (and as it turned out when I did manage to stop and get some shots on the way back up the hill, they were pretty pitiful since they flattened the drop to the bottom of the cliff). Once at the parking lot, we headed out to the main attraction. I should have known then that I’d need my birding lens, but, no, I decided to carry my 17-50mm and 70-200mm lenses because those were what I would need for scenic shots. One thing you can always count on in photography is that the lens you really want is back in the car or at home. On our way to The Devil’s Postpile we were assaulted by this Red-Breasted Nuthatch that simply wouldn’t be ignored, so what was I to do but shoot it with the 70-200 mm lens, which means I ended up cropping most of the shot out. It probably didn’t help that I was using multiple focal points, as I almost always do in scenic photographs but never in bird shots; so the poor camera didn’t know what to focus on. 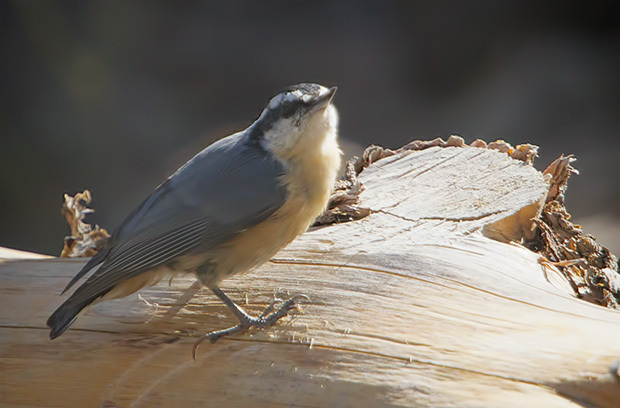 Still, I was happy with the shot because I rarely see Red-breasted Nuthatches, or any other nuthatches, for that matter. I was even happier when this Mountain Chickadee showed up in the same spot because I’d never seen one. 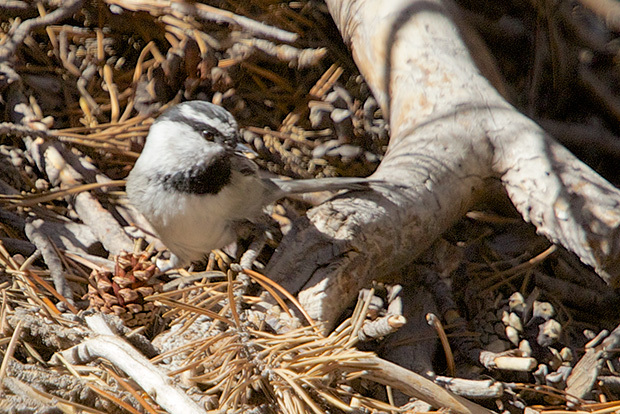 I was definitely tempted to hang around and try to get a better shot of the Chickadee, but the trail was suddenly full of tourists, and we needed to get going to see Bristlecone Pines after we saw the Devil’s Postpile. 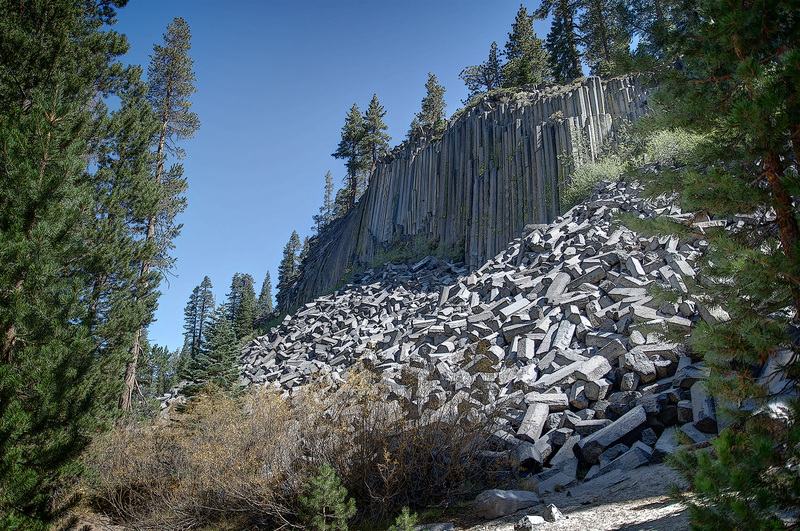 It was definitely worth the short walk to view the Desert Postpile. Heck, it would have been worth the walk just to see the geometrically shaped stones at the bottom of the cliff. The difference was that we looked at them from the highway, never getting nearly as close as we did to this structure. 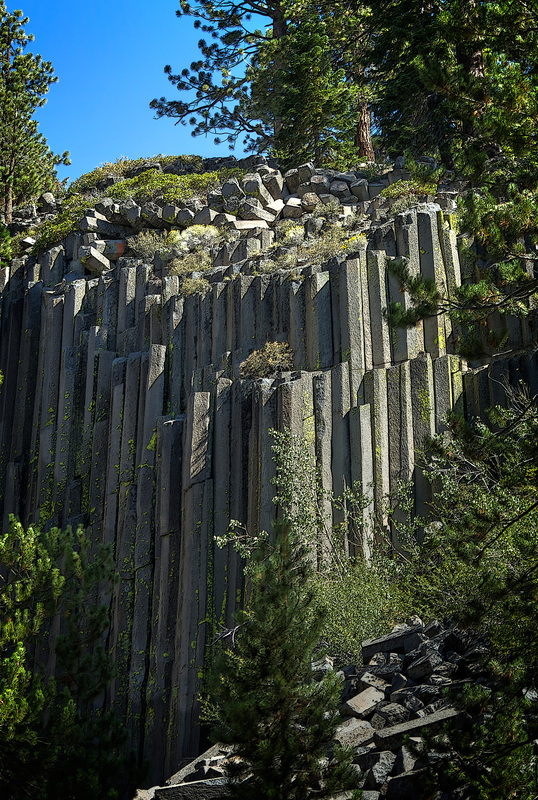 With the telephoto lens, it almost seemed that we were right next to the columns. Of course, after we got home Debbie told us that we should have climbed to the top of the cliff to observe the mosaic pattern the rocks form when looking directly down on them. Just another reason to return when we have more time to visit.